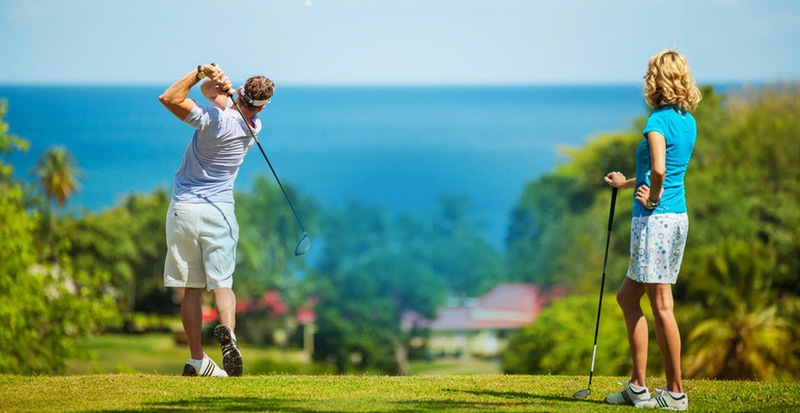 Golf enthusiasts planning a tropical vacation to the Caribbean will be pleasantly surprised to know that there is a host of world-class golf courses in this region with a sublime setting and scenic backdrop. The Sandals Resorts come with some of the most prestigious and challenging golf courses in St. Lucia, the Bahamas, and Jamaica. Each of these courses offer everything, including a tee for golf experts as well as for amateurs looking to make their first shot. The best part is that all guests get to enjoy a complimentary green fee, which is included at all the courses. 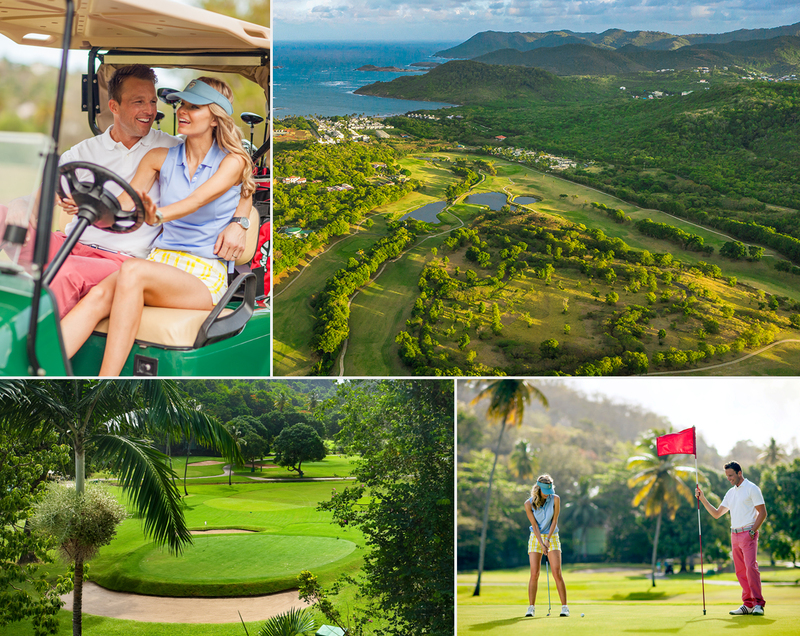 St Lucia enjoys the luxury of two (2) challenging golf courses, which are great for all levels of play. 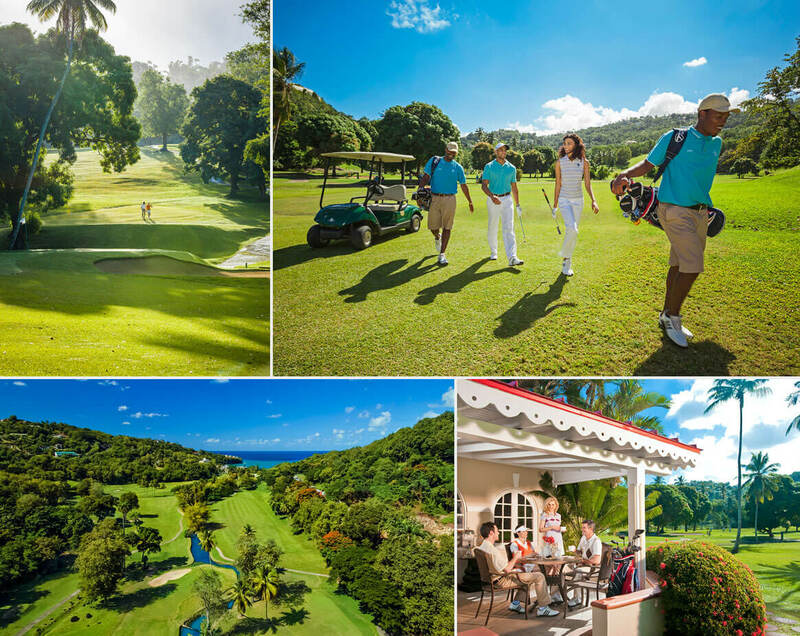 Nestled in the scenic tropical valley and surrounded by lush hills, the Sandals Regency La Toc Golf course is a challenging, executive-style golf course. Golfers, regardless of their skills are bound to enjoy the gorgeous greens and fairways on this course. The 9-hole golf course features 3,300 yards of narrow fairways and rolling hills punctuated by the bursting colors of bougainvillea, crepe myrtle, among other florid blossoms. While the layout of this course is short, at only 3,141 yards, playing in this terrain is definitely challenging. Some of this course's holes are tight, making it difficult to make a clean shot. They therefore require great accuracy. This 18-hole, par -71 to 6771 yards golf at Sandals Resort overlooks the Atlantic ocean and the Caribbean Sea. Since its inception in 2001, the course has become one of the most demanding layouts in the Caribbean. It features sprawling green slopes dotted with lush foliage and attractive ponds. Located in Great Exuma, Bahamas, the Sandals Golf Course delicately takes on Greg Norman's award-winning design, which aims to preserve the land's stunning peninsula and pristine beauty. The Sandals Emerald Bay Golf is one of the most picturesque ocean-side golf club and resort in the Caribbean. This course uses an environmentally friendly shore paspalum grass, which provides a lavish, deep green canopy. 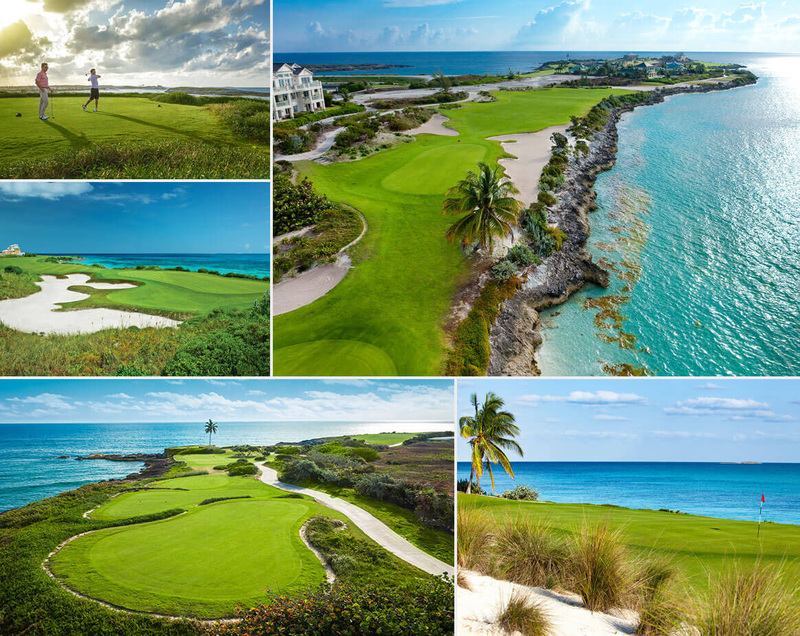 Stretching over 7,000 yards in length, this 18-hole and par 72 course is the longest in the Caribbean. It winds through an array of seashore dunes and magnificent mangroves along an impressive Emerald Bay's peninsula. It is renown for its hard fairways that snake through the seaside dunes with six (6) of its signature holes hugging the coastline of the scenic Emerald Bay Peninsula. Although the back nine holes offer interesting and scenic views, the first nine offer an interesting variation with holes that contain lakes, marshes and rock outcroppings. Rife trade winds provide new challenges and experiences with each golfing game. This category is available for all category rooms on 3+ paid nights. Any Sandal Emerald Bay guest that pays for 3+ nights receives two (2) rounds of golf with green fees included to enjoy while on their vacation. This is for guests who book Butler Suites on 4+ paid nights. Guests receive unlimited green fees, allowing them to play as many rounds of golf as they want. This offer is valid for all category rooms on 7+ paid nights. With this, guests get to play as many rounds of golf as they want. •	Practice bunker and range with chipping and putting greens. 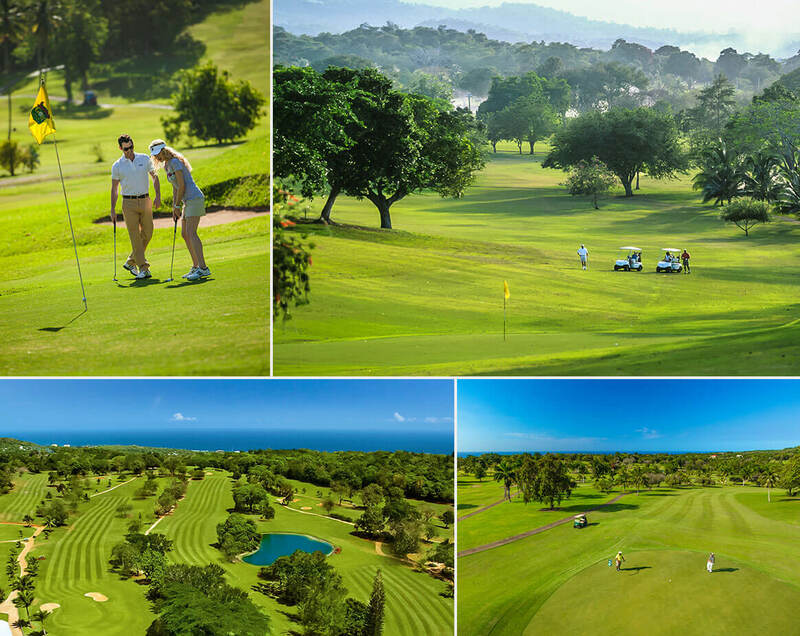 This magnificent par 71, 18-hole course is one of the finest golf courses in Jamaica and snuggles in the lush Ocho Rios Hills. It rises 700 feet above sea level and stretches over 120 acres of rolling landscape with stunning views of the Caribbean sea and St. Ann mountains cloaked in the dense vegetation. The course is characterized by narrow fairways that have been reformed with Bermuda grass while tiny, drop-off greens have been rebuilt with lush Bermuda grass for a beautifully manicured lawn. The Sandals Golf & Country Club course comes with three sets of tees and plays to 6,404 yards par 71. For those looking to practice their swing, you can head on to the driving range. The course has two restaurants; the Jamaican Jerk chicken shack and a traditional restaurant in the clubhouse. Also, free round trip transfers are provided from all nearby Sandals rooms.